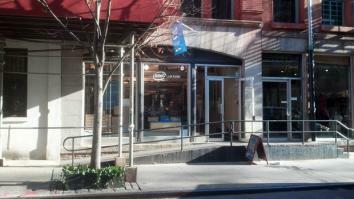 Intel Experience Store in NoLita, New York, can't seem to draw in visitors. Why Won’t Anyone Take the NYC Intel Experience Store’s Free Pizza? This week, Slate’s Matthew Yglesias posted two photographs that he believes show why Microsoft is struggling. In one image, the Apple Store at an Arlington, Va., mall is packed. In the other, the Microsoft store at the same mall is deserted. But Microsoft isn’t the only tech giant struggling to draw customers in to a physical location. The Intel Experience Store recently opened for business on Mott Street in Manhattan, in the borough’s NoLita neighborhood. Intel conceived its Experience Stores to showcase devices and curate its reputation among consumers. Through events and partnerships with local vendors, the company hopes to create a “community hub in the mornings,” a “technology showcase in the afternoons,” and “an entertainment hot spot in the evenings.” Similar pop-up stores have arrived in Chicago and Los Angeles and will operate through the holiday season until Jan. 25, 2014. The NYC retail space is slick and wide-open, and often cast in a somber glow by its blue interior lighting. It’s lined with computers and staffed by employees who are cheerful and welcoming, but also a bit desperate. So far, attendance at the Intel Experience Store seems low. Depressingly low. More often than not, employees appear to outnumber customers. During my first visit, I was on the verge of entering (or rather, being entered) in a drawing for a laptop. I then learned that no drawing could take place because, as the only patron, the odds were exceedingly in my favor. On a subsequent sojourn, an employee awkwardly tried to convince me to incorporate the Intel Experience Store in my social media. It’s a shame, really, as the store has a lot to offer. Each day of the week boasts a theme with corresponding activities. Some are better conceived than others: Sunday is Sports!, which means free wings and football. That seems pretty great, though Big Apple apathy and the allure of food via Seamless Web should never be underestimated. But on Mondays, the store hosts free yoga, which is a poor choice because people here go West Side Story in debating SoulCycle vs. Flywheel. Location is partly to blame: Unlike the cobblestone roads that deliver pedestrian shoppers in SoHo, Mott Street doesn’t get much foot traffic north of Kenmare Street. And based on an informal survey of those in the neighborhood, it seems the store arrived with little advance fanfare–which, admittedly, fulfills the most critical trait of a pop-up shop. But while the element of surprise is something you would want if you’re fighting, I don’t know, Trojans, it’s a curious strategy for augmenting brand recognition. Perhaps most perplexing is determining if the Intel Experience Store is, in fact, a store. It verges on being anti-retail: If you purchase one of the machines advertised on the floor, you’ll have to schlep to a nearby Best Buy to pick it up. Morgan Spurlock could live comfortably on all the gratis swag and services, which the staff is eager to unload (“coffee! laptops! massages!”). I’m sure many consumers outside of tech circles are familiar with the company’s electronica-tinged jingle, its Pentium brand of processors, and not much else. Whether that marketing battle can be won with free pizza and yoga, across from the Basilica of Saint Patrick’s Old Cathedral, remains to be seen.